Shigemi Matsumoto has performed with over 50 national and international opera companies including those in San Francisco, Philadelphia, Pittsburg, Brussels (Belgium), Wolf Trap, Portland, Kansas City, San Antonio and Tucson. Her opera roles include Mimi, Musetta, Susanna, Micaela, Norina, Adina, Pamina, Despina, Rosina, Nanetta, Lauretta, Violetta, Abigail, Adele, Zerlina, Yolanda and Frasquita. She has performed with more than 60 national and international symphony orchestras including San Francisco, Los Angeles, St. Louis, Minnesota, Houston, The Boston Pops Orchestra, New Orleans, Lourdes (France), San Antonio and Denver. Ms. Matsumoto has given more than 300 solo recitals including recitals in the major cities of New York, Washington D.C., Chicago, Tokyo, Philadelphia, San Francisco, Los Angeles, Vancouver, Seattle, Houston and Dallas. As a young singer, she won numerous national and regional awards and grants including First Place in the Western Regional Metropolitan Auditions at the age of 21. At 22, she won the Grand Prize in the San Francisco Opera National Auditions, and with that, her first professional contract. San Francisco Opera became her "home" company and she remained with them every year, for 7 consecutive seasons. She appeared in the company's fall and spring opera seasons, and Maestro Kurt Herbert Adler, General Director of the company, became her mentor. Throughout her professional singing career of 22 years, Nelly Walter, one of the world's most respected opera managers, and Vice-President of Columbia Artists Management, Inc. (CAMI), managed Ms. Matsumoto's career, from their New York headquarters. She appears on two CDs with Luciano Pavarotti and one with the NBC Orchestra and has been nominated for and appears in nearly twenty different Who’s Who publications, from all over the world. She was honored to be selected as Japanese Woman of the Year for Southern California. In 2007, she was the recipient of the Hans von Leden Award honoring World Voice Day. In 2016. Ms. Matsumoto was honored to receive the Distinguished Alumni Award from her alma mater, California State University, Northridge. 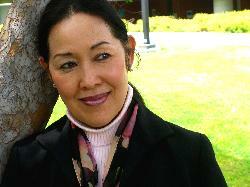 Ms. Matsumoto is the Founder and the President of the Classical Singers Association, better known as the CSA (classicalsingersassociation.com). This member supported, non-profit association of singers, is dedicated towards developing the performance and professional singing skills of its members. This association has a long standing tradition of bringing some of the finest singers, conductors, and directors to the members of the CSA in participatory masterclasses and seminars. Founded in the early 1990's by Ms. Matsumoto, and having had thousands of members throughout the many years of the association, the CSA has been a mainstay in helping young singers become better educated in the musical requirements necessary to become a professional singer. Amongst her many performance opportunities, she was also selected to be the guest soloist for the celebration of the Founding of the United Nations. Her many performances have included performances with such luminaries as each of "The Three Tenors", individually, (Luciano Pavarotti, Placido Domingo and Jose Carreras), Leontyne Price, Beverly Sills, Frederica von Stade and Seiji Ozawa amongst many more.